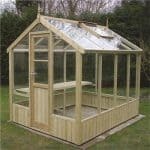 This is an exceptional greenhouse with plenty of interior space for all your gardening needs. 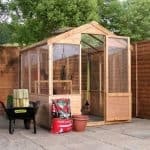 Spend hours inside comfortably; the greenhouse comes ready assembled for ease and with the staging, all vents, auto vent openers, damp barrier and toughened glass so you can be ready to go in minutes. 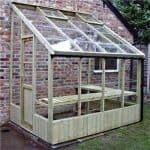 The wood is pressure treated so will need no further treating and the glass is sealed with a quality silicone. 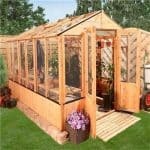 It is an excellent all-round choice and looks fantastic too. Due to its popularity there is normally a 2 to 3 week lead-time – however it is well worth the wait! 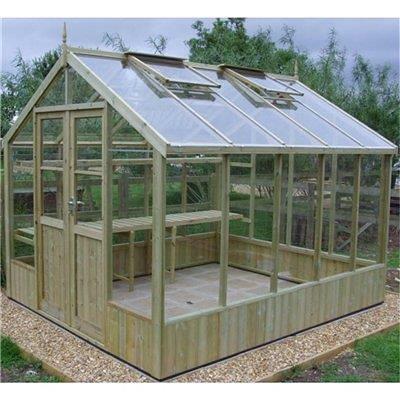 This greenhouse is quite spacious and airy. 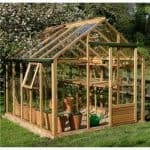 But for some reason my plants are not growing properly in this greenhouse; they are becoming meager and slender. Though I haven’t found any specific reason for this problem but I am guessing it is happening because of the glass covering. Maybe they are not well-fitted. I have this feeling because few days back, when it was raining, I have noticed some water droplets on my plant, which was not there before. So it proves that there is some kind of leak through which the water is getting into the greenhouse. If this is the case, then there will be a serious problem for controlling the temperature inside it. So I would ask the company to help me fix this problem. 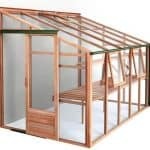 This greenhouse is so spacious and exactly what I was looking for. I am glad it isn’t painted. I like the look of it and if I do decide to paint it, the paint will look great since it wasn’t previously painted. I think the company did a great thing by not painting it, because each person has their own preference when it comes to color. This is big enough for all of my plants and flowers. They are getting all the sunlight they need. The pressure treated wood is my favorite part of this, and the fact that there are auto vent openers is always nice.